The year was 1969, and the place was The Museum of Natural History at the Smithsonian Institution in Washington, D.C. 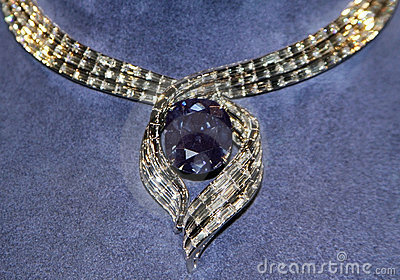 I was one among hundreds of people standing in a long line to view an exhibit: a famous jewel called the Hope Diamond. As the visitor line slowly inched its way forward we were treated to other items on display, mainly large geodes of amethyst, ruby, sapphire, and emerald. I was utterly amazed at the size of some of the geodes and could not begin to fathom how it must have felt to unearth one of those gigantic rocks, slice it open, and discover the gems within. I was seeing some of the earth’s most fabulous treasures in their raw state. As I moved closer to the main reason for my visit, I was filled with excitement. When my turn came to step in front of the viewing window, I did so with great anticipation. However, what happened next proved to be one of my life’s most embarrassing moments. The Hope Diamond was not exactly what I expected, and so I gasped (audibly) and declared (again quite audibly), “It’s blue!!! !” All around me in the crowded room I could hear chuckles and laughter. At that moment I would gladly have welcomed the floor beneath me opening and allowing me to be deposited elsewhere! I have since learned that diamonds can be many different colors. In truth, something else happened that day in the midst of that embarrassing situation: a lifelong love affair with gems began. Even today, years later, the passion has not waned, and gems are one of my greatest interests and delights. I am as equally amazed today as I was that day in 1969 by the beauty the earth can produce. These treasures have been produced by time, compression, and the correct elements. In certain cultures some gems are believed to offer healing to the wearer. Revelation 21: 19-20 tells us that in Heaven the walls are built on foundation stones inlaid with twelve precious gems! Can you imagine how unspeakably beautiful it must be? The next time you are in a jewelry store and can view lots of gems, take a moment to appreciate the wonderful treasures the earth can yield—a priceless gift from the earth to us.